You can trust the professionals at Lawrenceville Family Dental Care for expert teeth whitening services offered at competitive prices. 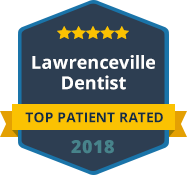 We are a comprehensive, family dental practice that provides complete cosmetic dental care including teeth whitening for the residents of Lawrenceville and the surrounding areas. Our dentist utilizes the latest in advanced teeth whitening technology to help our patients achieve bright, beautiful, long-lasting smiles. Our dental practice offers both in-office and at-home teeth whitening solutions. Our dentist can help you select the tooth whitening system that best suits your needs as well as your budget. For safe and effective teeth bleaching in Lawrenceville, GA, call Lawrenceville Family Dental Care. Teeth bleaching is a highly popular cosmetic dental procedure that is used to lighten teeth and remove stains and discoloration. It can be used to brighten your smile and to give your smile a more youthful, healthy appearance. We offer a whitening treatment that can be completed in our dental office in a little over an hour. We also offer custom trays that can be used at home with a gel-like whitening solution. Our tooth whitening solutions achieve dramatic results that create dazzling smiles for our patients. Ashish Patel is a premier teeth whitening dentist you can trust to help you achieve a bright and beautiful smile. Your smile is the first thing people notice upon meeting you and we want to help make your smile the best it can possible be. If you are currently unhappy with the appearance of your smile or if you think your smile could be improved, contact Lawrenceville Family Dental Care today to schedule an appointment with one of our talented cosmetic dentist. We thank you for allowing us to take care of your dental needs and we look forward to exceeding your expectations.